I don’t know about the rest of you, but it has been really really hot in Los Angeles. All I want to do is drink cold water and eat cold food. Cooking is not something that I look forward to in all honesty. Today’s post is one of those perfect meals that not only does not require any cooking but it is also so simple and fast to make. I have fond memories of my teenage years when my mom used to make this type of soup during hot summer days. 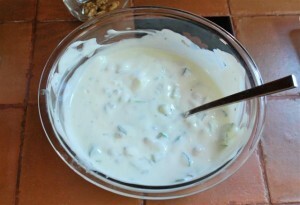 Mast-o-khiar is referred to both the soup and dip version of this dish. 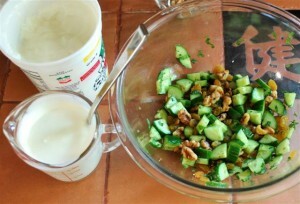 While they are both made with yogurt and cucumbers, I personally use different ingredients when making each dish. I will post the dip version in the near future. 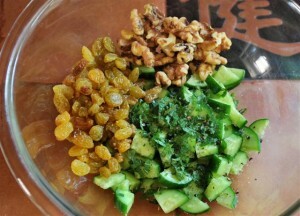 I would like to start this recipe by saying that for better results it is best to use Persian cucumbers. These are smaller than the regular cucumbers seen in grocery stores. Additionally, their skin is also much much thinner, and therefore, they can be eaten with their skin on. 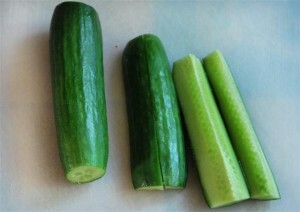 If using regular cucumbers then it is best to discard the middle part where the seeds are. 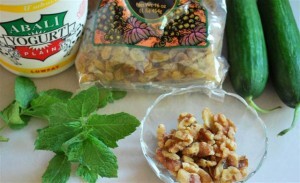 A good alternate to Persian cucumbers is Japanese cucumbers. You can play around with the ratio of the ingredients to better suite your taste buds. The general rule of thumb for me is one Persian cucumber per person. This recipe is good for two people. Here are out cast of characters. I am so excited to use the mint from my own garden. The snails every so often they do a number on my little plant, but it keeps on coming back. This is an optional step depending on how you like your nuts. I always like to toast nuts as it not only brings out their flavor but it also makes them crunchy. 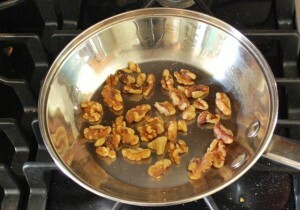 You can toast your walnuts either in a toaster oven, in the actual oven, or in a pan. Just keep an eye on it because they burn quickly. This should take only a few minutes. Here are them beauties! I love these cucumbers, I really do. 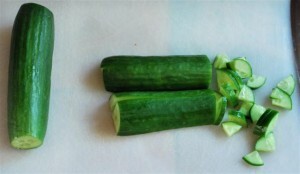 Cut each cucumber in quarters lengthwise. Now chop them up. I like my cucumbers somewhat chunky so that they are crunchy. Place all ingredients in a bowl. Season with salt and pepper and mix well. For this dish we want a soup consistency, so you can use any yogurt you want. I am somewhat picky about my yogurt, I don’t like it too tart or runny. 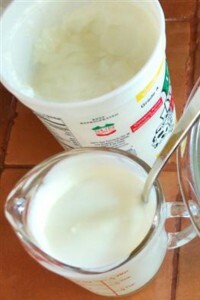 If using yogurt purchased at a Persian or Middle Eastern store, before placing the yogurt in the mix make sure that you give it a nice stir in order to make it smooth so that it is not clumpy. It’s is a little hard to see, but notice how the yogurt in the measuring cup is nice and smooth compared to the rest in the container? That’s what we want. 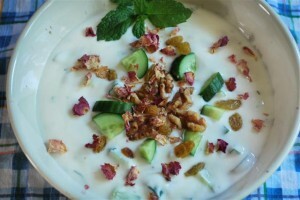 Garnish the top with some walnuts, raisins, and rose petals. On a very hot day you can even throw a couple of ice cubes in there. That’s is going to make it even more refreshing. I love how every spoonful of Mast-o-khiar is filled with the cool and delicate taste of the cucumbers along with the sweetness of the raisins, nuttiness of the walnuts, and the refreshing taste of mint. What’s even better are the spoonfuls that catch the rose petals. YUM! Stay cool folks! Wow, can’t wait to see other Persian recipes! I LOOOOVE Persian food, but can’t get good Persian food here in my area. This sounds positively amazing, and I am so glad to have found it (and for your contribution to Summer Fest). Nice to “meet” you! I just love mast-o-khiar! Our version is a lot simpler though. Whenever we have a feast at home it is always kebabs and always have this yoghurt to go with the rice – love it on the tah-dig. I updated a post on my blog recently with some pictures from Iran that a photographer friend let me use. You stopped by the right place then Jaden! Nice to “meet” you Margaret. This is really exciting and I glad I found out about it. Let me know if you ever make it and what you think of it! Veron, I loved the pictures. They reminded me of the good old days in Iran. People make mast-o-khiar depending on their own taste. For example some people also like to add dill to it as well. It also depends if you make it as dip or as a soup. I love them both. Give this type a try it is so good! 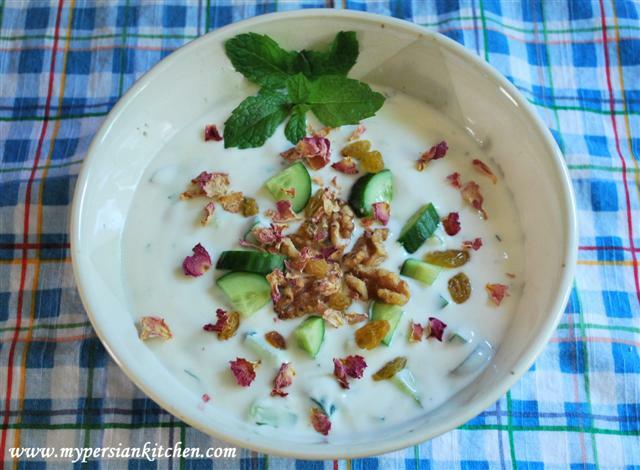 Wow, the beauty of Persian food lies in your beautiful soup! Everything is so fresh, so flavorful. Thank you so much for sharing this with all of us! m sure this will taste heavenly delicious!! Thanks so much for stopping by and your kind comment. I hope you will try making it and let me know all about it soon! Heavenly delicious indeed Nora, especially on a hot summer day! Mast-o-Khiar is the only thing that can cool me down on a really hot day. My family always made this totally different though. We would grate onions, garlic and cucumber into the yogurt and pan roast the mint for a few seconds with no oil and then added it. No walnuts and raisins either. I can’t wait to try yours… right now. Your version sounds delicious. I think Mast-o-khiar is one of those dishes that people make it depending on their own taste and possibly what is available at the time. Nevertheless, it is so good and refreshing! I never knew Mast O Khiar could be a soup as well. I may have to try this soon. Also if Japanese or Persian cucumbers are unavailable the English seedless variety can work well too. If I can find sour cherries in my Mid East markets here in Detroit, I will have to make Albaloo Polow for my wife. She loves cherries. It looks very appetizing and is a dish I have yet to try. You sure can make mast-o-khiar into a soup! Indeed English cucumbers are a good substitute. If you can’t find fresh ones you can use preserve or dried sour cherries as well. Can’t wait to hear all about it!